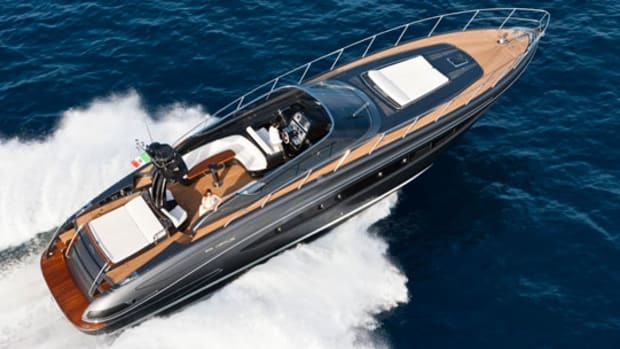 European Editor Alan Harper tests the fast, glamorous Riva 88 and finds a yacht that’s nearly impossible not to fall in love with. 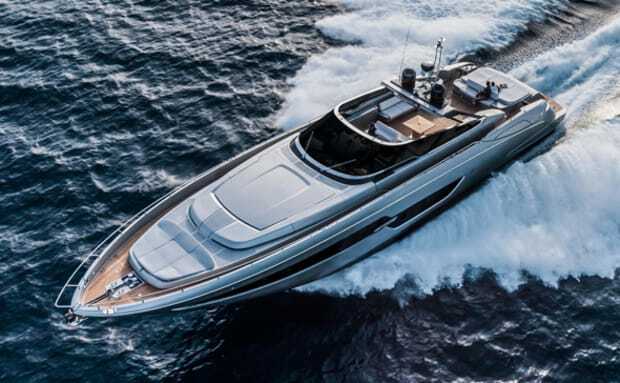 From her impressive top end to her unique convertible top, the Riva Florida 88 proves that life is just a bit cooler along the cutting edge. Like a lot of deluded fools I am inclined to declare, when asked, that I prefer the simple life. Family, friends, good food and drink, and I’m content. What more could a man possibly need? Well, as it turns out, quite a lot. It seems that the hippie hiding inside me also appreciates hot water on tap, foreign holidays, two cars, a boat, a canoe, and a rowing skiff, regular visits to my local wine merchant, more cameras than I can actually use, and a stereo that might be old but sounds terrific. 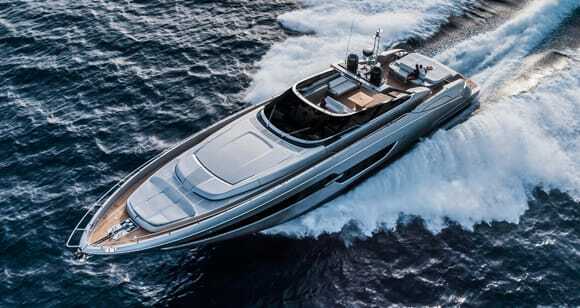 See more photos of the Riva Florida 88 here. Oh, and a smartphone, apparently. 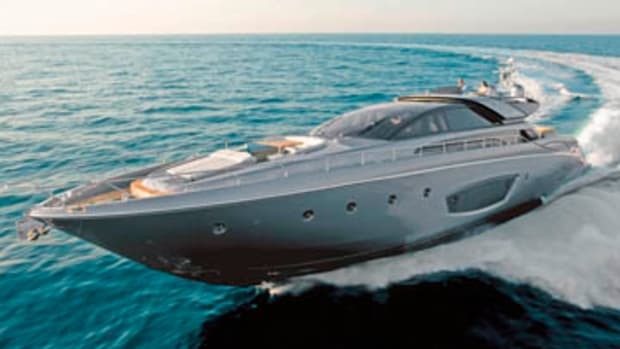 Deluded fools need regular reminders of the fact, and for me the most recent occasion was just off Porto Venere in the Gulf of La Spezia, aboard the fabulous Riva 88 Florida. I was watching the hardtop do its thing. Its thing is to raise itself from its position atop the helm area on two pantographic carbon arms, swing up and over the windscreen, and settle itself down on the foredeck. While it’s doing this two hatchways in the coachroof open up to receive the arms and close again noiselessly to conceal them. Voilà—your hardtop yacht has become an open. And a great-looking one at that. While my joyless inner hippie was thinking—“What does this do that a simple bimini doesn’t?”—the rest of me was practically applauding with delight. For this is Riva’s world. No matter that the hardtop can only protect you from the sun—gaps down the sides will let in wind and rain—and no matter that when it’s down it places the foredeck seating firmly out of bounds. No matter, either, that it’s vastly heavier and laughably more complicated than a fabric bimini. It’s a superb piece of design, and as a prime example of expensive and gloriously pointless engineering it’s up there with the self-winding Breitling clock in Bentley’s new Bentayga SUV. Riva’s world is a fun place. And it always has been. Long before the brand developed its obsession with complex engineering solutions to non-existent problems, a Riva represented well-heeled hedonism as a lifestyle choice. The boats looked beautiful and packed serious horsepower, just as they do today. 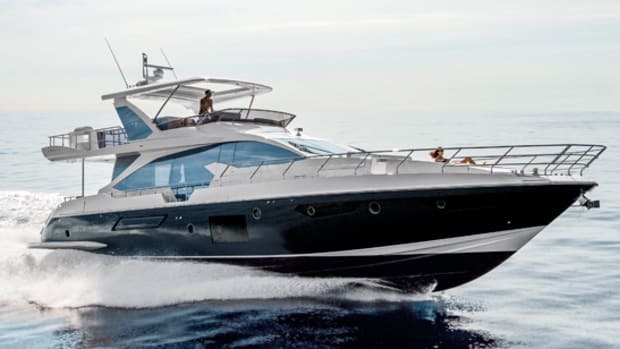 The 88 Florida has shaft drives, an easily-driven, medium-vee hull with just 12 degrees of deadrise aft, and a choice of two MTU engine installations. 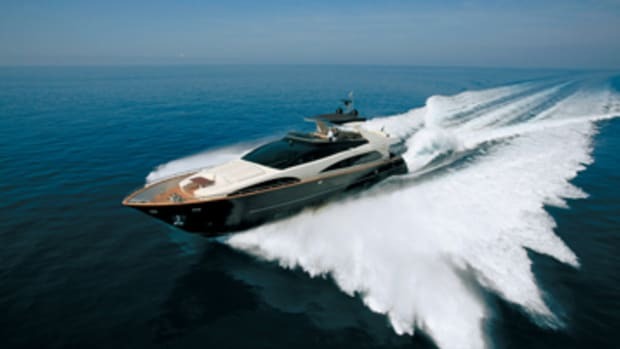 Our test boat, the first 88 Florida, was fitted with the meatier M94 V-16s and turned in a flawless sea trial, topping out at 41 knots. Unlike its varnished mahogany namesake from the 1950s, it’s no ski boat, of course. 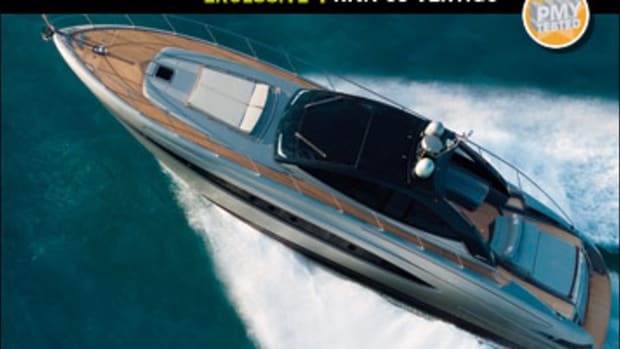 It might be the biggest open ever built by Riva, with that trademark curved windscreen—which is constructed from seven sections and costs, according to the project manager, the same as a Range Rover Sport “including options”—but it displaces 70-plus tons and provides the sort of relaxed, confident, and secure driving experience that you get from a powerful limo. 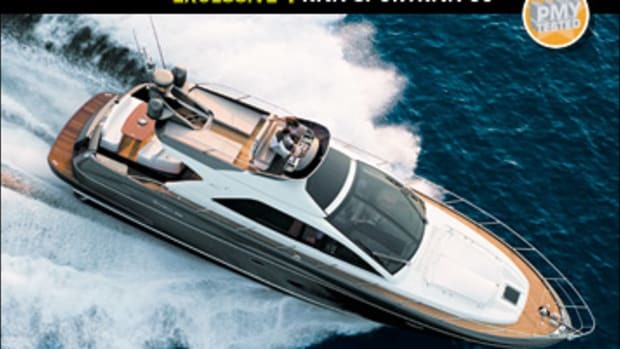 Cruising is quiet and comfortable at speeds from the mid-20s all the way up to the high 30s, and when things get a little choppy the hull will plane as low as 17 knots or so, with a little help from the trim tabs. Those engines are set well aft on V-drive gearboxes, so unless you’re a mechanic cursing the intrusion of the tender garage overhead, this means measurable benefits elsewhere in the hull. 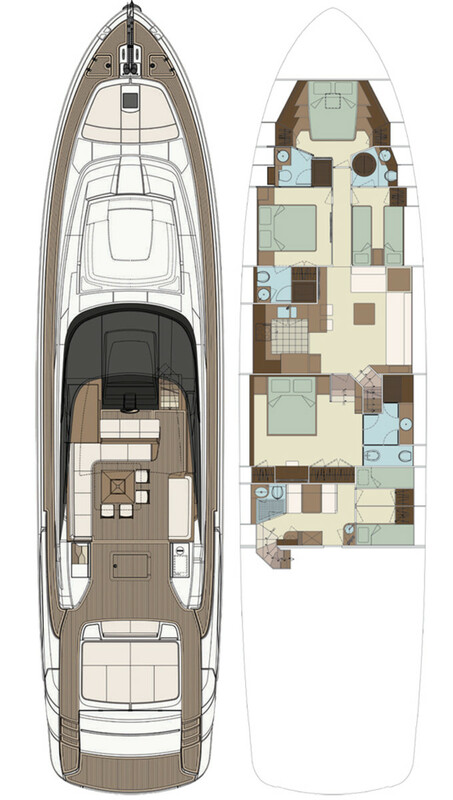 A four-cabin lower-deck layout is centered on a remarkably spacious saloon and galley area, complete with breakfast bar. Headroom here is nearly 7 feet, light floods in through big hull windows, and the warm, bright elm veneer is treated with an unusual matte ‘peach’ varnish, which feels soft to the touch and thereby provides the senses with both a visual and tactile contrast to the polished steel highlights. A good en suite guest double and a less spacious but still well-appointed twin-berth cabin face each other across the forward corridor, while the VIP suite in the bows is not exactly large but has plenty of useful stowage space and a roomy head. The twin has en suite access to the dayhead on the starboard side. Substantial hull windows and well-placed mirrors accentuate daylight levels throughout the guest areas. Nowhere is this reflective sleight of hand achieved to better effect than in the owner’s suite, aft of the saloon and down three steps. Reflected light and sightlines exaggerate the expanse of an already generous apartment, with its bookshelves, dressing table, wall of hanging lockers, and king-size bed. The beautifully appointed head and shower is on the starboard side. Headroom in all cabins is 6 feet 6 inches, and the guest accommodation is insulated from the machinery space by a pretty roomy two-berth crew area, accessed via the cockpit. Although it’s undoubtedly a comfortable weekender, the Florida is probably destined, like its mahogany ancestors, to serve out its time as a day boat. Clear flexible panels can be fitted to seal the gaps around the edges of the hardtop, while more substantial infills of rigid acrylic are also available—although where these could be stowed when not in use is something of a mystery. If you really want a weatherproof main deck you might be better off looking at the Florida’s sister ship, the Domino Super. 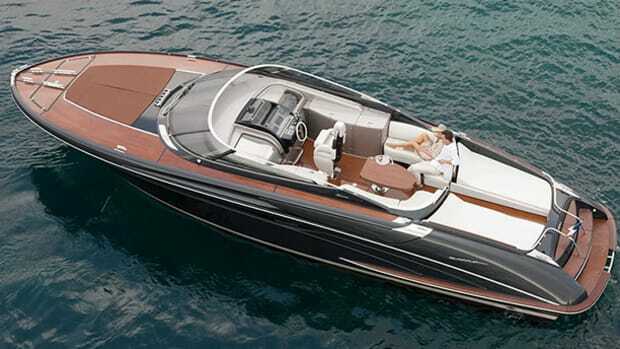 Quality is another Riva trademark, and the new Florida is nothing if not refined. Over-refined, in places—one example that springs to mind in addition to the inescapable hardtop is the odd section of transom attached to the end of the extended passerelle, which seems more complicated and less elegant than a straightforward hinged flap would have been—the boat is nevertheless beautifully put together and bursting with pleasing details, like the little doors in the superstructure concealing the fuel and water fills, the old-school analogue dials at the helm alongside the glass screens, and the superb fairing and painting on the radar arch. It looks like fiberglass, but it’s really stainless steel. 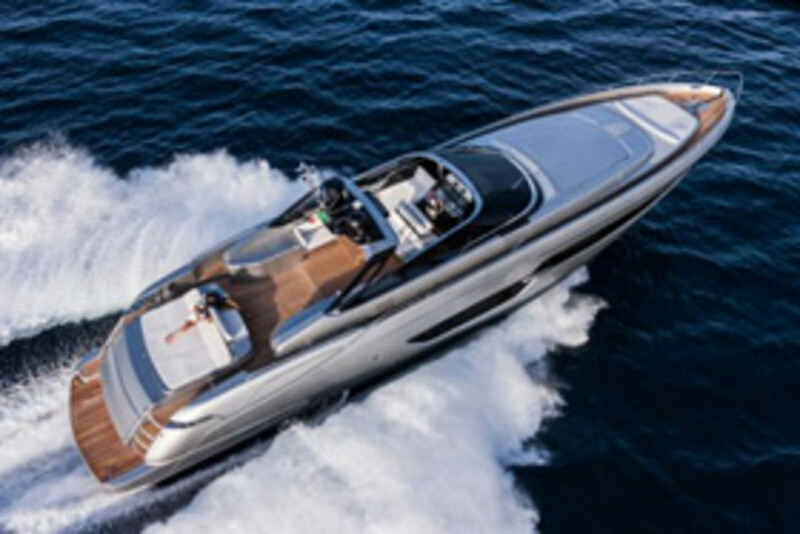 Optimized for the open air, the Riva 88 Florida looks the part like few other yachts in its class. That sleek and powerful profile is complemented by an excellent cockpit layout. The helm seat is at the sociable center of things. Eight people can sit down in comfort at the huge unfolding dining table, while for less formal entertaining the seating and sunlounging spaces could easily absorb 20 or more. There is a bar, grill, and fridge, in case the main galley, down seven steps on the lower deck, feels too far away. The tender garage features a mercifully straightforward launching system for the Williams 385 as well as a jet-ski. Sunshine, turquoise waters, family, friends, good food and drink—these simple pleasures are exactly what the Florida was designed for. Well, that and the entertainment value of its clever, complicated and hilarious hardtop. The simple life? It’s all very well, but maybe Riva’s world is a little more fun. 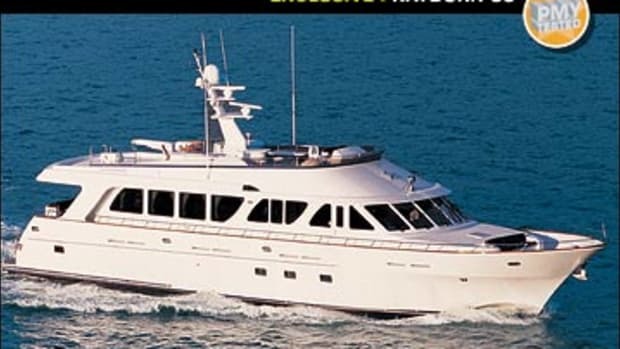 Noteworthy Options: Custom Moon Gray exterior paint; 2/20-kW gensets; 108,000 BTU ‘super tropical’ a/c; 40-hp hydraulic stern thruster; Seakeeper gyro stabilizer; 48-gph watermaker; cockpit fridge; stereo and TV upgrades; 3/17" touchscreen MFDs at helm. Prices available upon request. 844 gal. fuel, 177 gal. water, 9 persons, safety gear only.